Tout de Suite Buttercup! : Is My Id Preggers? I usually don't have pregnancy dreams, but in the last week I've had two! In the first dream, I was pregnant and struggling with overwhelming guilt because I had been drinking beers during my pregnancy. WTF?? I knew that I was pregnant because my stomach was growing larger each day and when I rested my hand on my belly I could feel the dream baby kicking against my palm. In the dream, I was having heated, horror-struck conversations with my friends where I was telling them how I had been drinking one or two beers per night for a few weeks, and I was terrified that I had somehow harmed my baby's development. The bizarre thing was that it was like I had just suddenly realized that that might be a possibility. My friends were trying to reassure me, but failing miserably. I understood part of that dream. I had it my first night in my new apartment, after spending my last week at my ex's place packing up my belongings, watching SATC and HBO marathons. During that somewhat trying week, I pretty much survived on pizza and the best beers ever, and had at least one, if not 2, beers each night. Interestingly, I had no dreams during that last week; at least none that I recall. Drinking beer by myself, at home, during the middle of the week, was unprecedented for me, and apparently it generated some guilt in my mind - even though at the time I thoroughly enjoyed it. I remember thinking randomly at one point towards the end of the week that I was happy the move was finally going to happen because then I could go back to more healthier habits. So, I understand the beer. But, the pregnancy? I have no idea where it came from. Last night, I had another pregnancy dream. In the second dream, I was pregnant but no one knew. I had started to show (even though no one knew), and I was coyly trying to hide my somewhat obvious bump (that everyone should have been able to see, but somehow didn't). In the dream, the baby was my ex's, which was somewhat ironic. At some point in the dream, my swollen belly hardened, and started to hurt. I was becoming worried and didn't know what was going on. At some point, I sat down on a bed covered in white sheets. When I got up to leave, I looked back and discovered that I had left three bloodstains behind. It turned out that the cramping and pain had been because I was getting my period, and not because I was pregnant. My subconscious provided no explanation for the bump or the hardening of my stomach. What the heck does that mean? (Here's one possible interpretation). As if that was not enough to ponder, I just got an email from my ex on my work email, out of the blue, telling me that he thought I would want to know that two of our friends are pregnant. He has a knack for doing things unthinkingly that I find completely inexplicable. The last time I spoke with him was last Saturday, when I politely called to let him know that I had removed all of my belongings from his apartment, and that he could move back in. Getting back to whether I would want to know from him that two of our sort-of-mutual friends are expecting... No, not really. Thanks anyway, but I actually do not need him emailing me that others are engaged in happily wedded, expectant bliss. After years of trying to make it work with him, I actually don't need or want him for anything anymore, thank you very much. I can hear great news like that from others fine, and be thrilled for them, like my own sister, Bean (who I'm so happy is engaged in happily wedded, expectant bliss). But, from him? I don't think so. Sometime ago, Jennifer Aniston, talking about Brad Pitt, remarked that he was missing a "sensitivity chip." Apparently, many men are missing the same chip. Watch out, Angelina! Despite the possible cravings of my id, thank God my ego kept me from going down that road with someone who so clearly was not right for me. The man I choose to have a baby with will have to come with a built-in sensitivity chip for sure! Update: I was just talking to Bean about the picture I posted with this post (not Bean's tummy) and telling her how I thought it was fake, but wild. She started telling me that apparently this can happen, that mothers can see the limbs of their children pushing out against their stomach! Is this true? She also said that our Mom said (this is now third hand) that when she was pregnant she could see our feet pushing out against her stomach, similar to the posted picture. As Bean was telling me that, I started to feel faint and like I was going to vomit. I don't know if I could handle that. It's too alien-esque for me. Those are some bizarro dreams! And how strange that Raj should email with that news. I see what you mean, though -- that would make me... uncomfortable, frustrated, and upset. Here's one interpretation I found of the pregnancy dreams: "To dream that you are pregnant, symbolizes an aspect of yourself or some aspect of your personal life that is growing and developing. You may not be ready to talk about it or act on it. This may also represent the birth of a new idea, direction, project or goal. To dream that you are pregnant with the baby dying inside of you suggests that a project you had put a lot of effort into is falling apart and slowly deteriorating. Nothing works out the way you want it to." I would say this is an accurate assessment of my personal life in light of the break-up. "If you are really pregnant and having this dream, then it represents your anxieties about the pregnancy. Women in the first trimester of their pregnancy tend to dream of tiny creatures, fuzzy animals, flowers, fruit and water. In the second trimester, dreams will reflect your anxieties about being a good mother and concerns about possible complications with the birth. Dreams of giving birth to a non-human baby are also common during this period of the pregnancy. Finally, in the third trimester, dreams consists of your own mother. As your body changes and grows, dreams of whales, elephants and dinosaurs and other larger animals may also start appearing at this stage." You and Bean are both right; the picture is fake, but you can definitely feel baby body parts when you're pregnant. Butts, elbows, knees -- you can feel it all. The picture is still fake though. 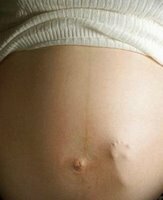 You can feel feet, but stomach skin (plus uterus, amniotic sac, etc) is way too thick to actually see the outline of toes like you can in the picture. Pregnancy dreams are common for people who are expecting - but also for people close to them! When my best friend was pregnant - I got all of her pregnancy symptoms instead of her - and that included regular pregnancy dreams - weird but interesting! Maybe you're getting them because of Bean's pregnancy? Leisha - That may be. Hearing that Bean had become pregnant profoundly affected me, so it's possible it's possible. She's not getting any pregnancy dreams, so maybe I'm experiencing them for her. i used this same pic on a blog entry from last year about alien babies & it still freaks me out to see it!